A performer attempts to read the newspaper while water fills and empties in the tank for Holoscenes. Lua Shayenne tries to gather her persimmons in Holoscenes. “When I’m in the tank it’s that frustration of the water coming in and destroying what I’ve built,” said Lua Shayenne, the persimmon peddler. Performers spend from 45 minutes to an hour and 15 minutes doing “everyday things” in the tank. Besides selling fruit, performers try to read a newspaper, use a garden hose or tune a guitar. These activities are constantly interrupted by water that rises and falls at different speeds. The floating is at the same time beautiful—her clothes billowing around like ink in water—and jarring—she’s scrambling to breathe. A performer tries to tune and play a guitar under water in Holoscenes. A couple years ago, he knew wanted to do an art piece about water in the 21st century. And as simple as water's molecular structure is—two parts hydrogen one part oxygen—its role in our world is not. His research brought him stories about climate change, melting glaciers, sea-level rise, carbon dioxide and a few Al Gore talks. 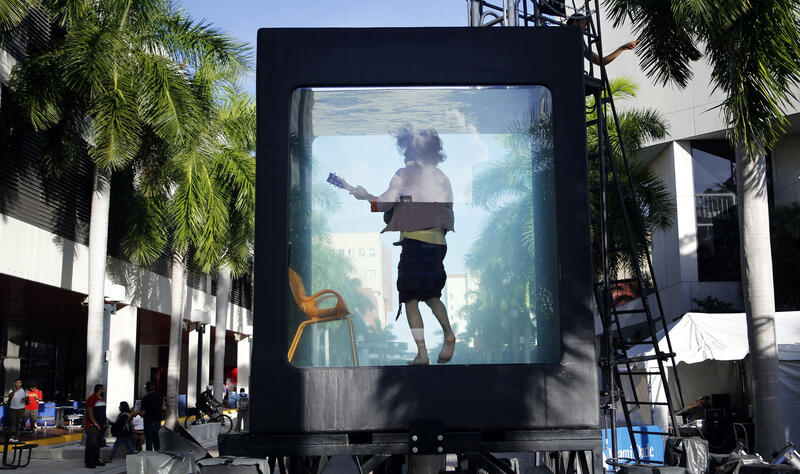 While this piece wasn’t made specifically for South Florida, the struggle that plays out in the tank clearly reflects the larger relationship this place has with water: rising seas. “We’ll need more people to get in those aquariums,” said Henry Briceño, associate research scientist at Florida International University’s Southeast Environmental Research Center. His research focuses on sea-level rise and the impacts it has on water quality. He says in 100 years the place where the tank is located in downtown Miami will look a bit more like the inside of the tank than the dry sidewalks outside. But communicating that message is something scientists struggle with, he says. Briceño points out South Florida’s ocean waters are rising more slowly than the Miami-Dade tap water inside the tank, so the immediacy of the performance art isn't reflected in the real world. The pump farm for the piece that allows the 3,500 gallon tank to fill and drain quickly. 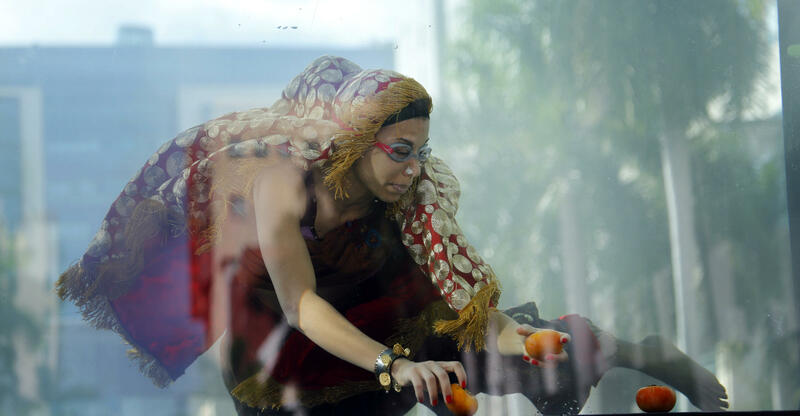 Therefore, the response isn’t the same, even for Lua Shayenne who plays the woman selling fruit inside the tank. By the end of the weekend, she’ll have spent hours in the tank as it floods and drains, but afterwards she has trouble bringing that understanding into her day-to-day life. “I think I fail,” said Shayenne. “I fail to be this human that can be a bit more kind to nature. Because sometimes I'm like, ‘how can I stop using plastic when people keep giving me plastic?’ 'How do I not use as much water?’ … So I do think about all of it and it’s scary. And there’s a hint of that fear as she bobs for persimmons. You can see Holoscenes at the pavilion at the Miami Dade College Wolfson Campus from 2 p.m. to 8 p.m. until Saturday.